Making the finalists this year after failing to make the semi-finalists last year made it more likely that last year’s snub really was more about eligibility concerns than general antipathy or lack of respect toward him as a player. The list of co-finalists was very favorable. First, Reggie Miller not making the list was a boon, as he could have taken the “best player” spot, and Rodman would have lacked the goodwill to make it as one of the “overdue”—without Reggie, Rodman was clearly the most accomplished name in the field. Second, Chris Mullen being available to take the “overdue” spot was the proverbial “spoonful of sugar” that allowed the bad medicine of Rodman’s selection go down. Congrats also to Artis Gilmore and Arvydas Sabonis. In my historical research, Gilmore’s name has repeatedly popped up as an excellent player, both by conventional measures (11-time All-Star, 1xABA Champion, 1xABA MVP, led league in FG% 7 times), and advanced statistical ones (NBA career leader in True Shooting %, ABA career leader in Win Shares and Win Shares/48, and a great all-around rebounder). It was actually only a few months ago that I first discovered—to my shock—that he was NOT in the Hall [Note to self: cancel plans for “The Case for Artis Gilmore”]. Sabonis was an excellent international player with a 20+ year career that included leading the U.S.S.R. to an Olympic gold medal and winning 8 European POY awards. I remember following him closely when he finally came to the NBA, and during his too-brief stint, he was one of the great per-minute contributors in the league (though obviously I’m not a fan of the stat, his PER over his first 5 season—which were from age 31-35—was 21.7, which would place him around 30th in NBA history). 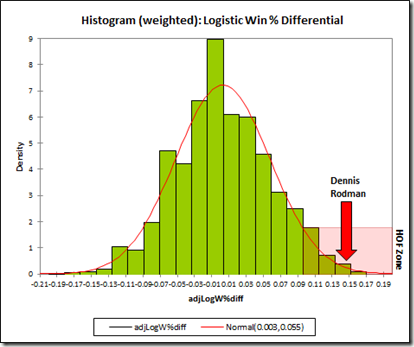 Though his sample size was too small to qualify for my study, his adjusted win percentage differential over his NBA career was a very respectable 9.95%, despite only averaging 24 minutes per game. I was hesitant to publish Part 4 of this series before knowing whether Rodman made the Hall or not, as obviously the results shape the appropriate scope for my final arguments. So by necessity, this section has changed dramatically from what I initially intended. But I am glad I waited, as this gives me the opportunity to push the envelope of the analysis a little bit: Rather than simply wrapping up the argument for Rodman’s Hall-of-Fame candidacy, I’m going to consider some more ambitious ideas. Specifically, I will articulate two plausible arguments that Rodman may have been even more valuable than my analysis so far has suggested. The first of these is below, and the second—which is the most ambitious, and possibly the most shocking—will be published Monday morning in the final post of this series. I am aware that I’ve picked up a few readers since joining “the world’s finest quantitative analysts of basketball” in ESPN’s TrueHoop Stat Geek Smackdown. If you’re new, the main things you need to know about this series are that it’s 1) extremely long (sprawling over 13 sections in 4 parts, plus a Graph of the Day), 2) ridiculously (almost comically) detailed, and 3) only partly about Dennis Rodman. It’s also a convenient vehicle for me to present some of my original research and criticism about basketball analysis. As I’ve said repeatedly, this blog isn’t just called “Skeptical” Sports because the name was available: When it comes to sports analysis—from the mundane to the cutting edge—I’m a skeptic. People make interesting observations, perform detailed research, and make largely compelling arguments—which is all valuable. The problems begin when then they start believing too strongly in their results: they defend and “develop” their ideas and positions with an air of certainty far beyond what is objectively, empirically, or logically justified. With that said, and being completely honest, I think The Case For Dennis Rodman is practically overkill. As a skeptic, I try to keep my ideas in their proper context: There are plausible hypotheses, speculative ideas, interim explanations requiring additional investigation, claims supported by varying degrees of analytical research, propositions that have been confirmed by multiple independent approaches, and the things I believe so thoroughly that I’m willing to write 13-part series’ to prove them. That Rodman was a great rebounder, that he was an extremely valuable player, even that he was easily Hall-of-Fame caliber—these propositions all fall into that latter category: they require a certain amount of thoughtful digging, but beyond that they practically prove themselves. 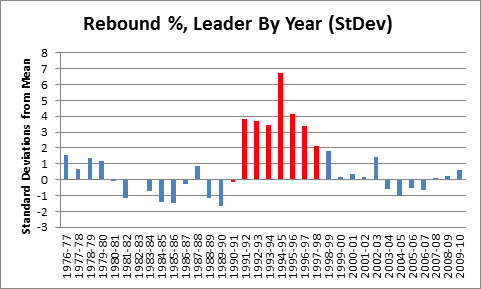 There are two things from my analysis that should be abundantly clear: 1) Dennis Rodman was an great rebounder, and 2) Dennis Rodman had a great impact on winning. Not only do I feel I’ve proven both of these to be true beyond any doubt, I think I’ve proven them to be even more true than I could have possibly guessed. 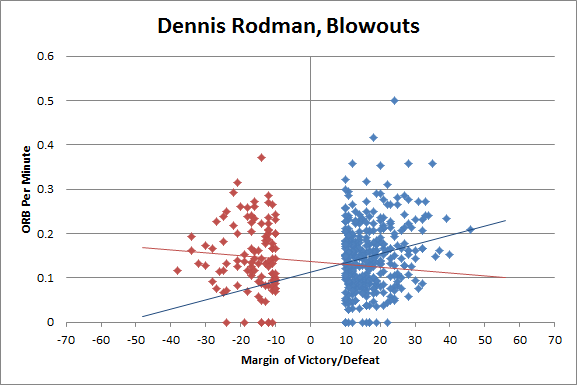 Which is to say, Rodman’s rebounding ability and his impact on winning both turned out to be significantly greater than I imagined at the outset. The initial post of course, has a more detailed explanation, including a recently-added comparison with some other great rebounders. And this graph actually doesn’t even account for the fact that extremely high predicted differentials should be far more likely to over-predict rather than under-predict a player’s actual differential. For those unfamiliar with “regression to the mean,” a quick illustration: Imagine 4 well-known sluggers who hit 25, 35, 45, and 55 homeruns in a particular season—who is most likely to have the largest increase in their HR total the following season? If you said they guy who hit 55, you are probably one of Barry Bonds’ attorneys. In practical terms, it means that we should favor the explanation with the fewest number of assumptions. In the medical case, you can either make two assumptions: 1) that the patient has incredibly rare condition x, and 2) that he has incredibly rare condition y; or one: that there is some condition z that you haven’t thought of yet (incredibly rare or not), from which x and y both follow. Rodman’s case is no different: We have two incredibly bizarre phenomenon that practically beg for a unifying explanation, or at least an explanation that would make them seem less bizarre. In Part 3(b), I briefly speculated about such a theory: that Rodman may actually have been “Reverse Clutch”—which is to say, he may have played worse in situations where the game was not on the line. Specifically, the theory goes, to pad his rebounding statistics, Rodman may have played sub-optimally in meaningless situations by going after extra rebounds. If he picked his “selfish” spots judiciously—that is, when the outcome of the game really wouldn’t be affected—this would have little to no effect on his Win % differential: he should win the same amount as if he had played optimally throughout. But, his team’s dominating wins would be slightly less dominant, and their bad losses would be slightly worse, which would have a negative effect on his MOV differential. Occam’s razor itself can be seen as a special case in the broader realm of Bayesian inference. But leaving the math and epistemology aside, the practical point is this: An explanation which itself seems like an incredible longshot, may indeed become likely, or even a virtual certainty, if it is the simplest way of explaining other phenomenon. Before getting into the ins and outs of whether this could be a plausible explanation (or at least explanatory factor) for our two freakish anomalies, we should check to see whether the theory is consistent with available data. We can clearly see upwardly sloping trendlines both in victory and defeat. In other words, in blowout games, the bigger the blowout, the more offensive rebounds Rodman grabbed per minute, regardless of which side his team was on. [Perhaps the “X” is for “X-Factor”?] This result is both consistent with and supportive of the theory: The wider the finishing margin, the more likely a game is to feature significant amounts of “junk” or “meaningless” time. 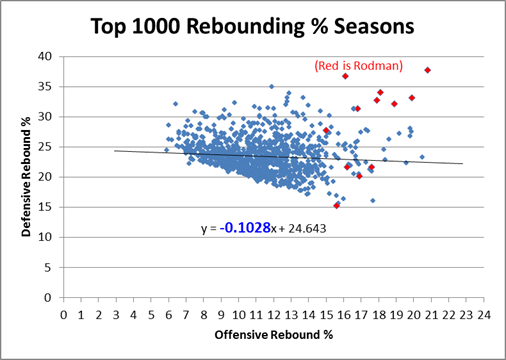 And the wider the finishing margin, the more rebounds Rodman grabbed. Obviously, these trendlines aren’t increasing in either direction (in fact, they are both slightly decreasing). 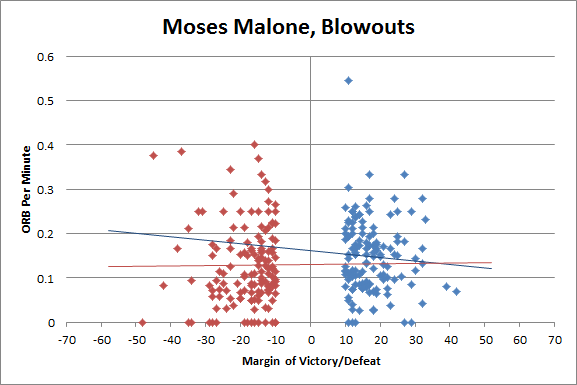 They are both much flatter, and lack the prominent “X” shape that Rodman’s had: Moses Malone doesn’t appear to demonstrate any propensity to become more rebound-happy in “non-crunch” time. While these sample-sizes are too small to prove anything on their own, if this proposed theory is one of the more plausible causes for our two provably extreme and independent effects, the data being consistent with and moderately supportive of the hypothesis could easily be enough to lend it considerable credence. Trying to draw potential conclusions about causal factors based on indirect (Bayesian) analysis like this is always tricky. First, you need to establish that your proposed theory, if true, really would be a plausible explanation (or significant contributing explanation) for your phenomena. And second, it has to be the best explanation possible. Meaning, your conclusion that z is the likely cause of x and y is entirely contingent on their not being a q that would be just as good of an explanation or better. In the real world (outside the safety of contrived exam questions), this second condition is much harder to satisfy: Even the most detailed studies, that include the most exhaustive considerations of conceivable factors, can be (and often are), scuttled by the tiniest failure of imagination. So on that front, I don’t have much to say except that I’ve thought about potential causes of these anomalies for a while now and haven’t thought of anything better, yet. 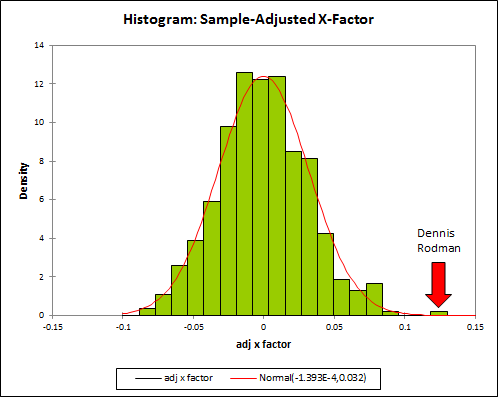 [I won’t go into all of the details here, but since someone will probably bring it up if I don’t, I should note that I’ve looked into the theory that Rodman’s lack of tradeoff could be explained by his abnormally low usage rate (which I’ll discuss a bit more in section b). 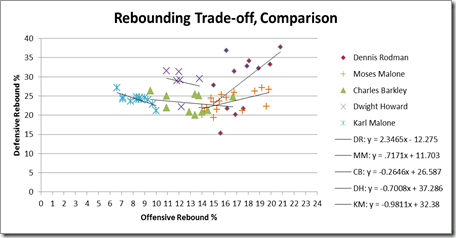 Though this sounded promising on its face, the data didn’t back it up: the relationship between usage and rebounding tradeoff for both the league and Rodman himself is negligible.] Of course, I would love to hear any other suggestions. On the question of whether this explanation is plausible, I think so. As I’ve said before, professional basketball is a game of very small margins: 3 points is the difference between a Ray Allen jumper dropping in or rolling out, yet 3 points per game is the difference between the 2011 Boston Celtics and the 2011 Houston Rockets, and 3 points of MOV differential is what separates Kobe Bryant from Delonte West. I don’t think it would take that much intentional misconduct to shave several points off of a player’s MOV. And if you so desired, playing in a lot of lopsided games—as Rodman did—would give you ample opportunity to do so without meaningful consequences in the W/L columns. First, I imagine that the tradeoff between offensive and defensive rebounding rates exists as the consequence of very basic strategic choices: Imagine you’re a ball-boy and all you have to do is run out on the court and grab rebounds as efficiently as possible: you’d consistently run to the spot where you think the ball is most likely to go, wait there until the ball hit the rim, and then run wherever it actually goes. But an actual player has many competing factors: First, long before the shot is taken, he has to execute the offensive game-plan to maximize his team’s chances of scoring. Then once the play is no longer in his control, he has to position himself to maximize all potential outcomes: cheating too much toward the basket might leave you out of position when the defense gets the ball and opening up a lane for a quick break, or prevent you from getting back into your half-court defensive position in time. Similarly concerns exist on defense: being out of position could obviously open up a shot for your opponents, but could also hurt your team’s chances on the break, or leave you out of position for an effective transition after a made basket. We don’t need to get into every gory detail of offensive and defensive strategy, but the main thing to notice is this: basketball is an extremely dynamic game, and the decisions you make have consequences all over the court. And it’s not just rebound positioning, obviously, it’s everything: every movement you make in one direction or another affects where you can be two seconds later, which affects what kind of plans can be developed for 5 seconds later, and so on. When you have a million little tradeoffs like this, the most efficient way to organize them is to group those that work together and complement each other, such as those that lean toward one side of the court or the other. Of course, if you decided to eschew overall efficiency and go for every rebound regardless of the consequences, you would eliminate the constraining effect of, well, playing good basketball. 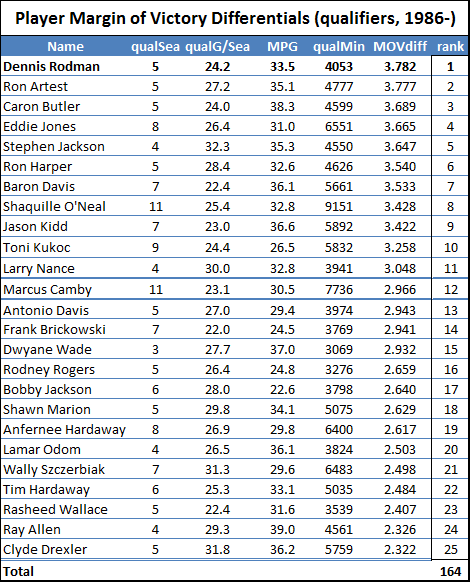 This is where “The Case for Dennis Rodman Was a Great Rebounder” and “The Case for Dennis Rodman” join paths: Showing that Rodman got a lot of rebounds without also showing that this significantly improved his teams proves neither that he was a great player nor that he was a great rebounder. But there’s an opening here that I didn’t (openly) consider at the time: Perhaps Rodman did sub-optimally inflate his rebounding statistics—at least in non-critical situations—but played even more damn good than we imagined, and could thus actually get away with it. 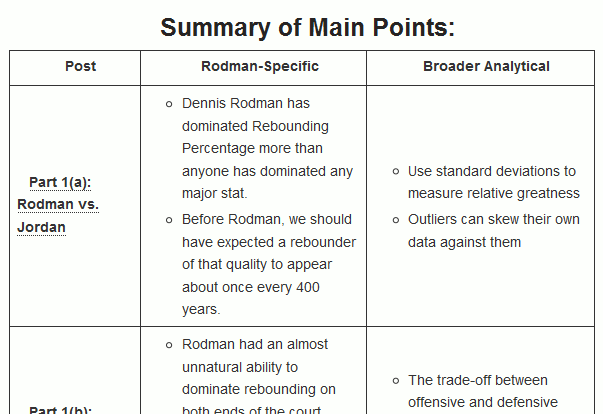 Indeed, if this theory—currently one of the only explanations for two independent virtually impossible statistical events, consistent with and supported by a cursory look at the data—is only partially true, and Rodman was at least partially a “selfish” player who cared more about padding his own rebounding stats than running up the score, not only would it imply that he was better than we thought, but that he should actually be All-Hall. Monday: Was Dennis Rodman Better Than Michael Jordan? OR% of opportunities interests me more than counts of ORs. A higher OR% had real value at team level. Yes, but that’s exactly why I chose ORB totals instead of %: I want them NOT to interact with winning for these purposes. Ok, just adding an observation of my own. Two questions that I’m hoping you can shed some insight on. First, let’s start with a case where one team is leading by 8 points in any of the first 3 quarters. My hypothesis is that their offensive and defensive efficiencies will have a lower expectation on the resulting possesion than they would when the game was tied (and that the team behind by 8 would see an increase). 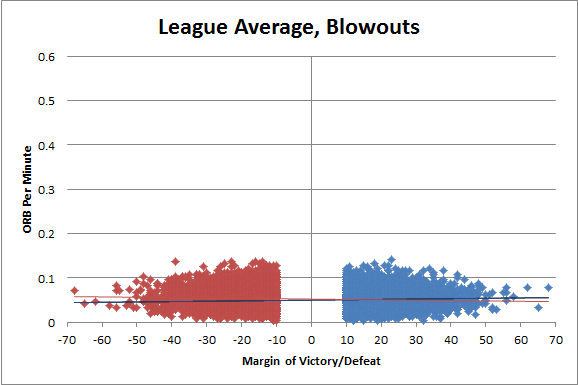 I base this mostly on observation — we don’t see enough blowouts in those cases. My causal explanation is mostly that the refs are keeping games artificially close. Have you done any work on a problem like this? Is there any evidence that efficiencies differ based on score differential? (I said first three quarters to remove any strategic considerations in close games, i.e intentional fouls near the end of quarter). Second question is just based on a conversation from the first game of the Dallas/Lakers series. Dallas is up 1 with 19.5 seconds left, and the Lakers have the ball. How often do you think Dallas wins the game? We don’t know if the Lakers will play for last shot or shoot early. 1. I haven’t looked at this question, but just intuitively, it wouldn’t necessarily mean ref interference. It would be correct strategy for a team to sacrifice efficiency in order to minimize variance and increase their chances of winning. A better way of looking at it might be: if a team is up by 8 at the start of the 2nd quarter, what are their odds of being up at the half? and how does this compare with the odds of a team up 8 at the end of the 3rd quarter going on to win the game? If the second is smaller, shenanigans would be much more likely. I haven’t looked at this, but it’s an interesting idea so I def. might. 2. I don’t know this off the top of my head, but I’m certain that models for this sort of thing are plentiful if you look around. Maybe Rodman’s rebounds went up in blowouts is that other players don’t fight for rebounds in blowouts and Rodman never eased up.